Larissa Explains It All...: Where am I From: Midwest or Mideast? I love traveling. No surprise there, right? I have been through Council Bluffs, Iowa / Omaha, Nebraska area over a dozen times - how's that for random? Which brings me to an experience I had one FHE (Family Home Evening) at BYU (Brigham Young University). We were getting to know each other and they said, "If you are from the Midwest, raise your hand!" Only one other fellow and I raised our hands. We both got overly excited and simultaneously asked each other, "What part?!" He responded, "Nebraska." "What?! That's the west! Ohio is the Midwest. There is no way you are Midwest cause you are 15 hours from me!" We were both very firm in our stances until someone decided that Ohio would be more "Mideast." Hmm..nope, that didn't work either as I didn't live in Western Asia or Northern Africa. I've, since then, taken to ambiguously telling people I'm from "back east." Although they do usually first guess I'm "not from around here." With all this Midwest/Mideast confusion I tell ya, I'm still not sure where I'm from - and I found an interesting forum thread from someone with a similar identity crisis here. And does looking up official maps help? No way - even those maps don't agree - check 'em out below. Without question Ohio is Midwest. Yes, it's in the Eastern USA, but regional names nod to the history of the area as much as the geography. 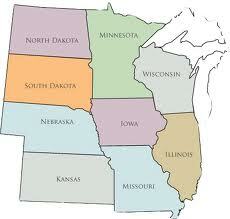 My opinion is that Nebraska is completely barred from being in the Midwest as it is West of the Mississippi. Further, the history and culture of NE is as different from Ohio, Illinois, Indiana, and Iowa as the later states are from the states further East. I'd define NE as being part of the Great Plains region. Or perhaps for something more geographic sounding the Old West region. But that's just the opinion of a gal who grew up in WA, claims PA, did time in UT, and now resides in TX. I don't have any first hand life experience with those middle states. I can answer this for you! And I've had this argument before. Ohio is DEFINITELY Midwest. I won't go into all the geographical explanations for it, but a large part of it has to do with the way land is plotted out. I've always considered Nebraska to be part of the Midwest as well, and the geography agrees with that for the most part. Ohio is in the heart of the Midwest. If you're getting pushback, you could say you're in the Central USA, I suppose. I'm with Janell on calling Nebraska part of the Great Plains (which I would consider separate from the Midwest but part of the Central USA, if that makes sense). I'd say the mideast is a thing just like the Midwest is. If you look at the map, Ohio, and Illinois is closer to the east geographically...so Ohio is Mideast. When in doubt, check Wikipedia. Ohio and Nebraska are both Midwest according to the U.S. Census. 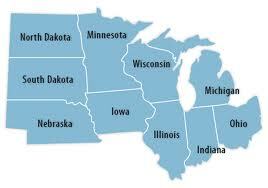 "The region consists of 12 states in the north central United States: Illinois, Indiana, Iowa, Kansas, Michigan, Minnesota, Missouri, Nebraska, North Dakota, Ohio, South Dakota, and Wisconsin." 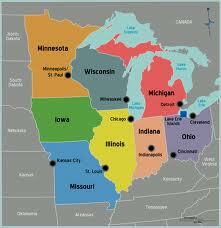 Ohio, Michigan, Indiana, Minnesota, Wisconsin, Iowa, Missouri, and Illinois are Mideast. 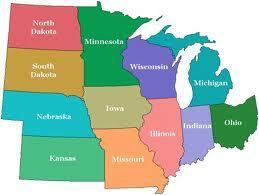 They are on the eastern side of the U.S. Kansas, Nebraska, South Dakota, and North Dakota are Central. The Old Northwest Territory of the United States is today's Great Lakes Region. This area has always been called the MidWest regardless of the Mississippi River's location. When the original 13 colonies spoke of the Northwest, they meant the states touching the Great Lakes. The region is sometimes now called the Rust Belt, but that is an economic label, not a geographic one at all. Rusty towns transcend geography and can be found throughout the Union.